"The Simpsons" is trolling President Donald Trump over his first 100 days in a viral video. 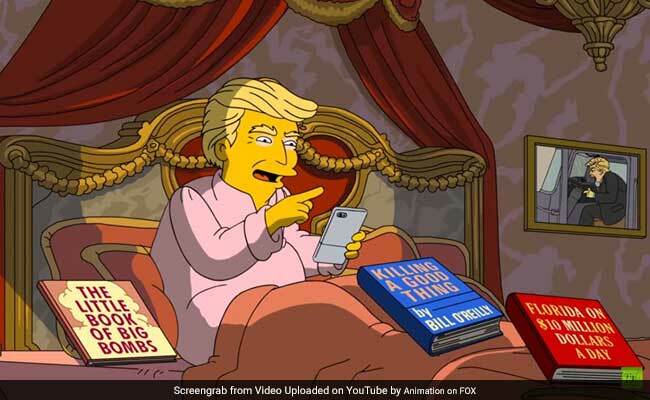 Los Angeles: "The Simpsons" is trolling President Donald Trump over his first 100 days in a viral video in which he boasts about his increased Twitter followers and reduced golf handicap. The 84-second footage posted on the Fox animated comedy's Twitter account offered a glimpse at the episode scheduled to air Sunday, celebrating the fact that Trump is 6.8 percent of the way through his term. The teaser, which had over 5.5 million hits on YouTube by Friday afternoon, opens at a sinister looking White House on a stormy night, where White House press secretary Sean Spicer can be seen hanging by a noose in the press room with a sign reading "I quit" hanging around his neck. "I am not replacing him," says Kellyanne Conway, fleeing in terror as she discovers the body. Upstairs, the camera dollies past Trump strategist Steve Bannon and what looks like the president's son-in-law Jared Kushner as they throttle one another. As chaos reigns, Trump is sitting in bed in pink pajamas, smart phone in hand, and surrounded by books -- a Bill O'Reilly tome entitled "Killing a Good Thing," a guide called "Florida on $10 Million a Day" and "The Little Book of Big Bombs." "A hundred days in office, so many accomplishments. Lowered my golf handicap, my Twitter following increased by 700. And finally we can shoot hibernating bears. My boys will love that," Trump says as his wig gets up and turns around, revealing itself to be a dog. "Here's a bill that you must read immediately. It lowers taxes for only Republicans," an aide implores. "Can't Fox News read it, and I'll watch what they say?" Trump responds. 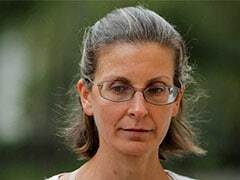 The president switches on his TV, and a news report showing his daughter Ivanka replacing Bill Clinton appointee Ruth Bader Ginsburg on the Supreme Court as a voiceover informs viewers they can buy her gavel and robe for just 1,000 rubles. "The Simpsons," which has 32 Emmys and famously predicted a Trump presidency in an episode aired in 2000, is nearing the end of its 28th season. First broadcast in December 1989, it is due to run through at least a 30th season, breaking a record held by Western drama "Gunsmoke" for the primetime scripted series with the most episodes.